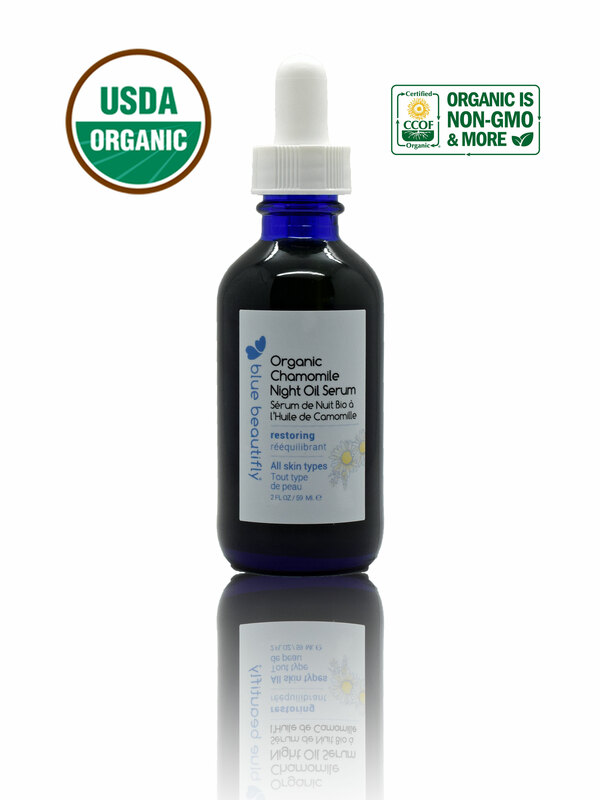 Organic Chamomile Night Oil Serum delivers a supple and dewy complexion. Its nourishing flower extracts and omega-rich oils soothe, soften, and condition the skin botanically. 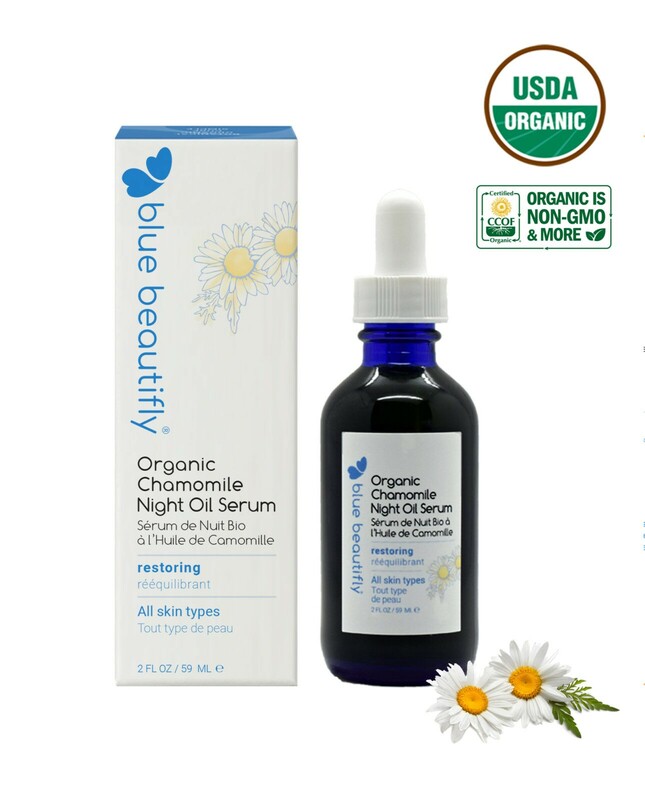 Turn back the time effortlessly with a few drops of Organic Chamomile Night Oil Serum! 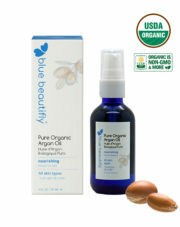 Blue Beautifly Certified Organic Facial Oil Serums are infused with restoring botanical extracts, precious oils, butters, and essential oils to nurture, condition, and deliver age-defying qualities. 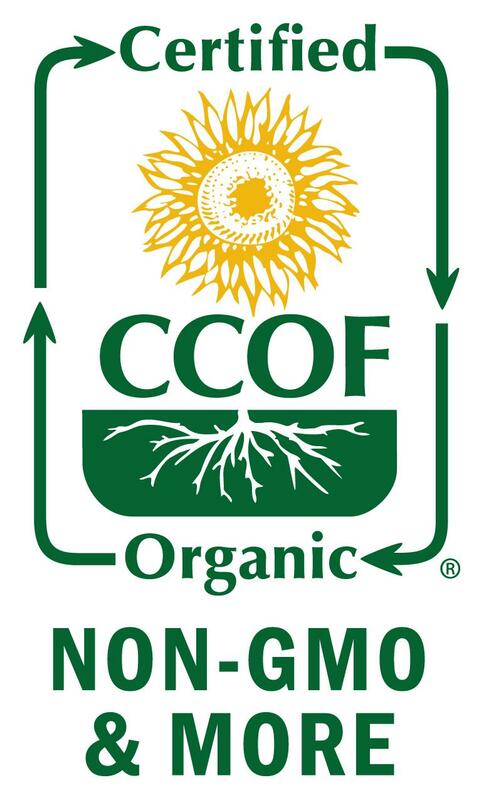 Organic Chamomile Flower. Containing vitamin A and zinc, It is known for its skin calming effect. Organic Helichrysum Flower. Contains flavoinoids and acetephenones. A recent clinical study suggests that Helichrysum extract assists in protection against skin oxidative stress and offers anti-aging properties. Organic Sea Buckthorn Berry Oil. Moisturizes, softens the appearance of wrinkles, and combats premature signs of aging. 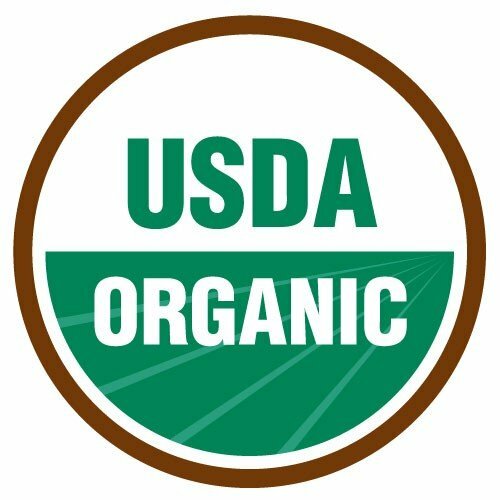 Organic Tamanu Oil. Soothes irritated skin, softens the appearance of wrinkles, and promotes cell turn over. 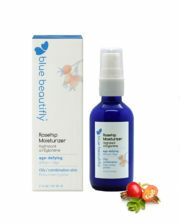 After using Blue Beautifly cleansers and tonics, apply two or three drops over the entire face and neck. Avoid getting directly into the eyes. Use morning and night. This is an incredible product and definitely the best face oil I’ve found. I would definitely recommend this product. After one use, it made my skin super soft! I have a review video on my Youtube channel that discusses this product further. Love love love this oil! An absolute must – have. Makes my skin soft, smooth and healthy!